An efficient workout routine requires a lot of thought and consideration. You cannot just keep altering your workouts daily. Many people still use the ‘One Muscle group a day’ philosophy when designing their routine or copy some professionals training plan that they found on the internet, without paying much thought to factors like, how long they have been working out, what is their strength level and how capable is their body. Since most people who visit the gym are not professional bodybuilders, this becomes counterproductive for many people as they feel under-trained or over-trained after some days and then drop out. In order to get results, you should be able to design a routine that is well suited for your body and sufficiently challenges you by making most of the fitness equipment available at your disposal. Utmost effort should be made to avoid stagnation in your training and boredom, because at the end of the day, you should be able to enjoy every moment spent in the gym. That’s why we are here to help you out. Whenever designing a workout routine follow these points to develop a more functional routine make your weightlifting journey more rewarding and more fun. Exercises like the Squat, Deadlift, Rows and the Presses should be the staple of your workout. These are your compound movements. They are the hardest to perform and should be given priority over other exercises. Your routine must revolve around these exercises. But the isolation type movements like the concentration curl, triceps push down etc. are also important to develop a well balanced physique. Following the compound exercises with the isolation exercises is very necessary to achieve results. Take an example of your BACK DAY. You should Deadlift first. Then do the next difficult movement. For some it may be chin ups, for some it may be a rowing type movement. Follow that with some machine type movement. That should do it for the Back. Do not perform hundreds of exercises for a single muscle group. You have to devote sufficient time to train each body part, even the minor ones like the rear deltoids, wrist flexor and the interior calf muscle. Try to adjust at least one exercise in your training program performed regularly for every small muscle group you can think of. Also, try to train one bigger muscle group with one smaller muscle group each workout. 1-3 – Absolute strength and power. 3-6 – Strength with some dense muscle gain. 6-12 – Hypertrophy and Strength. Compound movements provide ample of results in every rep range.However, the isolation movements are best performed within the 8-12 rep range. Switch between the above rep ranges for compound movements to avoid plateauing. Best way to do this is to cycle down your training cycle. By this we would suggest that you start your year with high repetition based training and then divide the year into the 4 above parts. You should include more Bodyweight exercises in your workouts. Always use exercises like the Bodyweight squats, the push ups, the dive bomber push ups, pull ups somewhere in your routine. These exercises not only provide you functional strength, but the muscle tone achieved by the virtue of such exercises is incomparable. Do Bodyweight squats at the end of your lower body workout. Do push ups at the end of your chest / shoulder days. Try to get a solid burn from such exercises. These exercises are also termed as ‘The Finisher’. You may use other exercises as finishers too. Just keep the reps high. 4. Balance out various muscles. Even out every point on your musculature that isn’t symmetrical to the rest of your body. That’s how you get a good looking, aesthetic physique no matter your size. You may notice that after some training, your shoulders may be dominating your entire body musculature, even though you trained every body part with the same intensity and hardship as your shoulders. This is mostly genetics. The only thing you can do about this is to hit the lagging muscles a lot harder and wait and savour the rewards you’ll receive due to your dedication. So, if your lower chest is bigger than your upper chest, lay off the dipping bar and do more incline barbell presses for a little while. If your quads are taking over your leg development, start your leg day with stiff deadlifts instead of squats. It is also important to exert sufficient effort on each body part. You will not get a good physique by training biceps three times a week and not training legs at all. Be sure to keep your lagging muscles in mind before designing a routine. Drop Set– Drop certain weight from the bar after performing a certain amount of reps, then carry on with your set. Repeat this over and over until you can barely move the muscle you are training. Overloading Sets– Inverse of the drop set. Start with a lighter weight and progress towards heavier weights in a single set. Partner sets– As soon as you are done with your set, your training partner starts with his set, and the cycle goes on, without changing the weights. 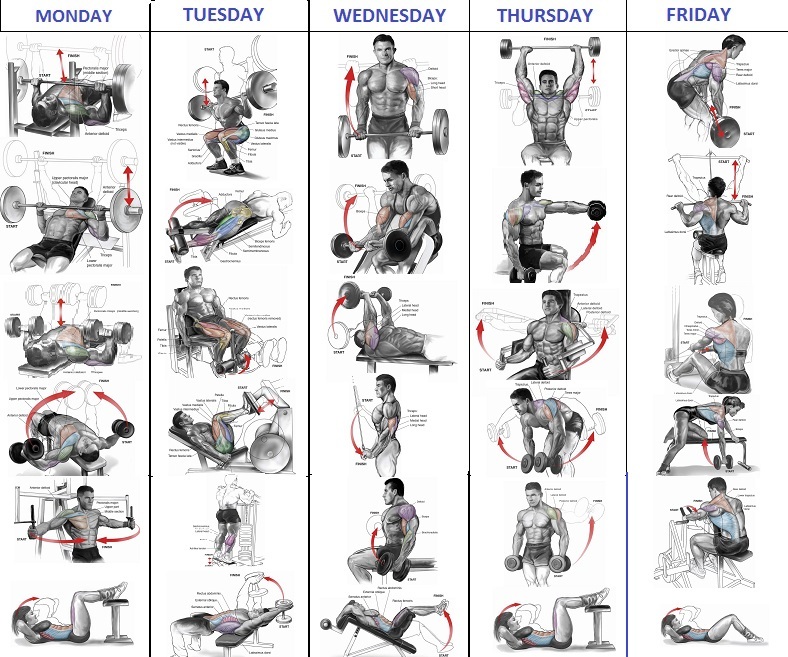 Super sets/Tri Sets– Couple 2 or 3 exercises together and perform them without taking rest breaks in between. You can use exercises that target the same muscle (Squats and Leg extension) or use exercises which focus on opposing muscle groups(Eg. Bench Press and Chin Ups). So the next time you develop a routine, don’t get overboard and do not over train. Use these principles to develop a followable regime and most importantly, STICK TO IT. Next articleHow Many Calories Are There in a Vada Pav & Does It Have Any Health Benefits?